Reviewed! Sevendust - "Cold Day Memory"
Sevendust haven’t altered their modus operandi throughout their near two decade career, and in all honesty, they haven’t yet had just cause to do so. They’ve yet to find a reason to change their accessible aggressive rock/metal sound, and there probably aren’t a lot of fans out there complaining. So enter “Cold Day Memory,” an album that finds the band right at home doing what they do best – being themselves. These guys have been treading water in the pool of commercial viability for most of their career, and lately they’ve been wading closer and closer to the deep end with each release, and here their eighth studio release really isn’t much of an exception to that idea. 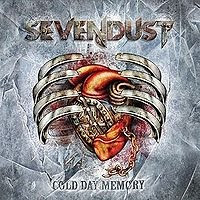 “Cold Day Memory” is more of the same formula that brought Sevendust to the dance in the first place – heavy, yet richly melodic, guitar driven songs essentially built in and around the remarkable vocal abilities of frontman Lajon Witherspoon. Though Witherspoon is often the focal point, the six-string contributions of founding member Clint Lowery, who left the band in 2004 to join his brother Corey (Stereomud) in Dark New Day, who finally returned home to Sevendust to roost, cannot be ignored. The band had been stuck in limbo during Lowery’s absence, as the albums released during that time frame (“Next,” “Alpha,” and to a lesser extent “Chapter VII: Hope and Sorrow”), were somewhat lacking, sonic proof Lowery’s axe-wielding presence was missed. Lowery’s return has gone a long way in helping the band to rediscover their passion as “Cold Day Memory” is a clear-cut return to form for the Atlanta, Georgia outfit. While the songwriting could pass as forgettable at points along the way (‘Ride Insane’), overall the songs speak for themselves. ‘Splinter,’ ‘Unraveling’ and ‘Nowhere’ show the band still have the necessary chops to reclaim their place atop the hard rock throne. “Cold Day Memory” is a driving force that rarely slows, even into the weaning moments of the disc, leaving powerful bullets like ‘the End is Coming’ and ‘Better Place’ in the chamber of the gun. The bands undeniable knack for entrenched melody is nearly unparalleled in the industry today, and the entire rock world is better for having Sevendust go back to their roots. “Cold Day Memory” isn’t reinventing the wheel. It doesn’t have to. All it needs to do is remind you why you started listening to this band in the first place in 1997 on their eponymous debut, a goal it accomplishes in spades.